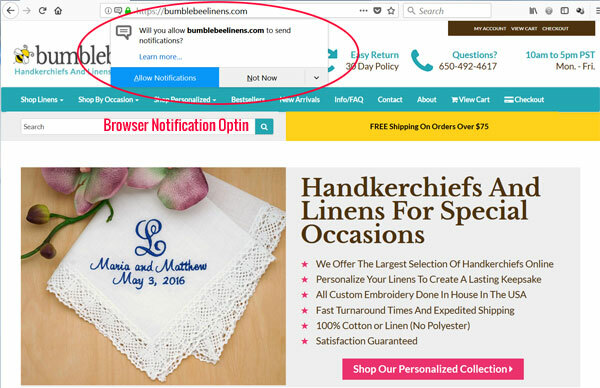 Even though most browsers and smartphones support push notifications, I still see very few ecommerce businesses leveraging them to their full capacity. 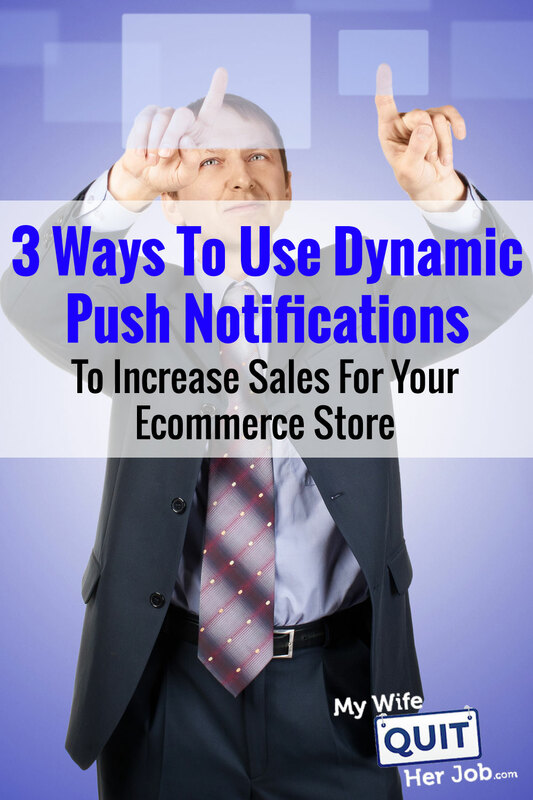 But used correctly, push notifications can boost your sales and traffic on autopilot and bring your customers back to your store over and over again until they are ready to buy. To whet your appetite, here are some actual numbers regarding how push notifications convert on my ecommerce store. Compared to other marketing channels such as email and Facebook Messenger, push notifications perform somewhere in between the two. In other words, push notifications are more effective than email in terms of engagement on a per subscriber basis but less so than Facebook Messenger. 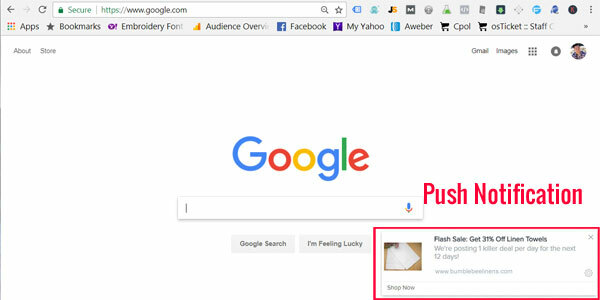 A push notification is a message on your smartphone or browser that notifies you directly on the task bar. The reason it’s called a push notification is because the message is “pushed” to you without any effort on your part. You can think of it like getting a text message except that it occurs directly in your browser. Here’s an example of a push notification on a desktop browser. And here’s what it looks like on a smartphone. 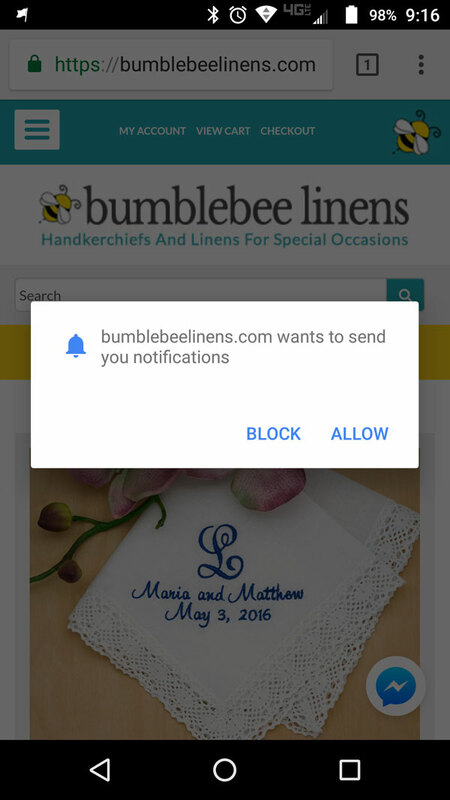 On a smartphone especially, the browser notification is instantly noticeable because it appears right in your notifications tray. As a result, the chances of someone seeing it are extremely high. Before you are allowed to send a push notification to a customer, they must first optin. There are 2 distinct types of optins that I’ve seen online. The first one is “native” to the browser and looks like the following photo below. What’s nice about this optin is that it is a one click process. As soon as they click “Allow Notifications”, they are instantly opted in. The second type of push notification optin involves a 2 step process. The advantage of the 2 step optin is that you can use enticing language to get someone to sign up. Here’s an example of a two step optin on my blog. As you can see, the optin message is branded and I offer a compelling reason to sign up for my push notifications. The disadvantage however is that it’s a 2 step process. After I click on the initial “Yes, Please” button, it takes me to a different window as shown below. Based on my testing, the 1 step optin performed better than the 2 step for my ecommerce store. But on my blog, they perform about the same so I stuck with the 2 step for MyWifeQuitHerJob.com. When in doubt, go with the 1 step optin. You can push customers who haven’t bought in a long time to revisit your site. The service I use to handle push notifications for my online store is a tool called Vizury. And the reason why I use Vizury over other solutions is because they specialize in ecommerce. In fact, I consider them the Klaviyo of push notifications. Note: I’m not affiliated with Vizury in any way and I’ve been using them for almost a year now to gather enough data for this post. Abandoned cart push notifications work almost exactly like abandoned cart email sequences. When a customer shops in your store and doesn’t complete their purchase for any reason, you can send them a notification to remind them to complete their purchase. This is where Vizury shines compared to other push notification services. Because Vizury is aware of all of the products that you sell in your store and monitors all of your completed purchases, you can send extremely targeted messages to your customers on autopilot. For example, let’s say a customer was browsing for personalized handkerchiefs in my shop but didn’t do anything else. They didn’t add it to their cart. They didn’t start checkout. It doesn’t matter. 4 hours later, they would get a push notification on their phone browser with a photo of the exact product that they were looking at! Then with a single click, the customer would be taken to the exact product page they were looking at to complete their purchase. This is amazingly powerful. Right now, I have 3 abandoned push sequences set up for my store as shown below. The second 2 notifications are sent within 4 hours and 2 days respectively if someone added an item to their cart but didn’t checkout. Collectively these 3 sequences have a conversion rate of 14.28%! And the best part is that I don’t have to do a thing. 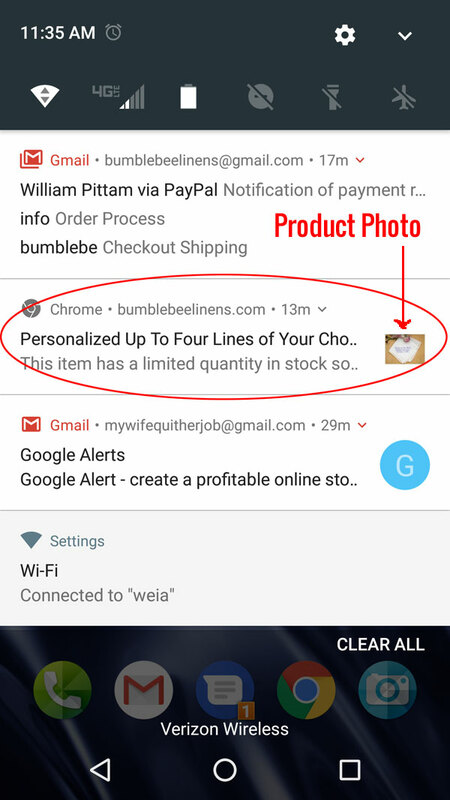 Note: The distinction between a viewed product abandon notification vs an abandoned cart notification is that the view abandon notification leads to a product page and the abandoned cart notification leads to a fully populated shopping cart ready to checkout. Both of these push notifications run on autopilot. Because Vizury has knowledge of your past sales, you can also send notifications to customers who have purchased from you before and but haven’t purchased in a very long time. In other words, you are trying to “win back” a customer who may have forgotten about your shop. Currently, we are sending out special coupon codes to customers who haven’t purchased in 30 days. Once again, these notifications are sent on autopilot. Every time we send out an email to our list, we also send out an equivalent push notification that mirrors the content of the email. For example, over the holidays, we ran a 12 days of Christmas sale where we ran flash sales every single day! Whereas some people can take multiple days to open and respond to an email, most people will react instantly to a push notification on their smart phones. As a result, for time sensitive promotions like 1 or 2 day sales, push notifications work extremely well. Over the Black Friday/Cyber Monday weekend, our broadcast sale push notifications were converting at 6%. Vizury also allows you easily segment your visitors based on a variety of parameters. For example, here’s a photo of your options below. 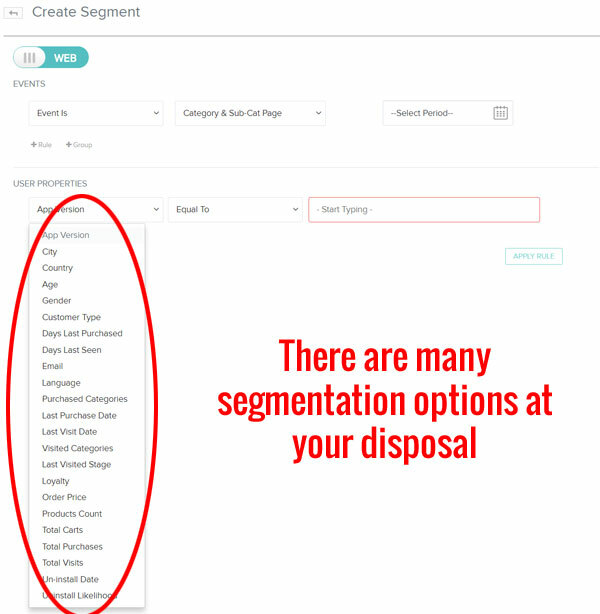 Here are some example use cases for customer segmentation. Geography – You may want to send special promotions based on where a customer resides. For example, I wouldn’t want to promote winter gear to residents in Hawaii. Customer Purchase Behavior – You may want to send out special coupons only to your best customers. Conversely, you may want to give out larger coupons to customers who have yet to make a purchase. 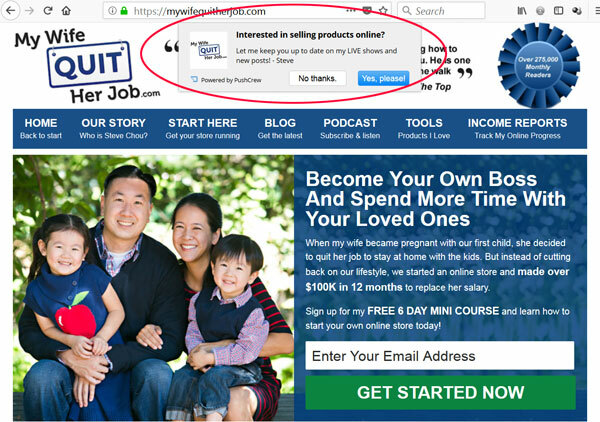 Customer Browsing Behavior – You may want to send out special broadcast offers of specific products based on the category pages a customer looked at. There are many possibilities here and what’s nice is that you can create segments on the fly based on past behavior. This is extremely powerful. First off, I want to emphasize that push notifications should never “replace” other marketing mediums like email, retargeting or messenger. Instead, you should be using as many different ways as possible to bring customers back to your shop. Push notifications are just another way to patch your leaky bucket of customers. But how do push notifications perform compared to other strategies that I’m using? Here’s a direct comparison based on numbers from my own store. Note: Take these numbers with a grain of salt because they are only a single data point. 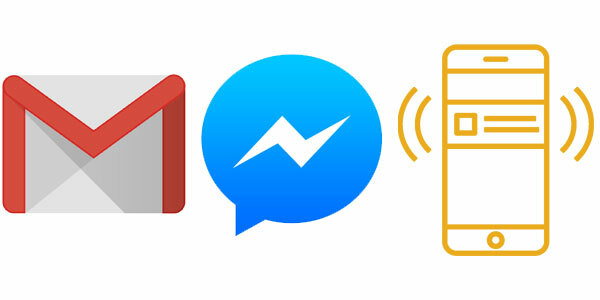 Overall, push notifications fall somewhere between email and messenger in terms of CTR. I also did some analysis in regards to revenue per subscriber but it’s difficult to make direct comparisons because the data largely depends on the type of push notification used. For example, an abandoned cart email or notification is obviously going to have a much higher revenue per recipient than a generic broadcast. That being said, I feel comfortable saying that my email abandoned cart sequences have a higher revenue per recipient than my push notification abandoned cart sequences. I think the reason for the lower performance is due to the fact that a push notification disappears immediately as soon as they are seen whereas an email stays in the inbox for future consumption. While push notifications work pretty well, we have received our fair share of complaints from customers who do not know how to turn it off. Unlike email or messenger, it’s not as clear cut how to unsubscribe. For example, in Chrome you have to navigate through a series of complicated menus to opt out and it’s way too involved to explain to a customer. Also unlike Facebook Messenger, there is no one out there policing push notifications as far as I can tell. As a result, I see this medium eventually getting abused by marketers. Either that or people will be more reluctant to opt into notifications. Right now, my optin rate is pretty low at 1.5%. Should you use push notifications? Absolutely! Anything that you can do to retain your customers and bring visitors back to your site is a no brainer. What I like about Vizury is that the abandoned cart sequences and the winback campaigns can be run on autopilot. 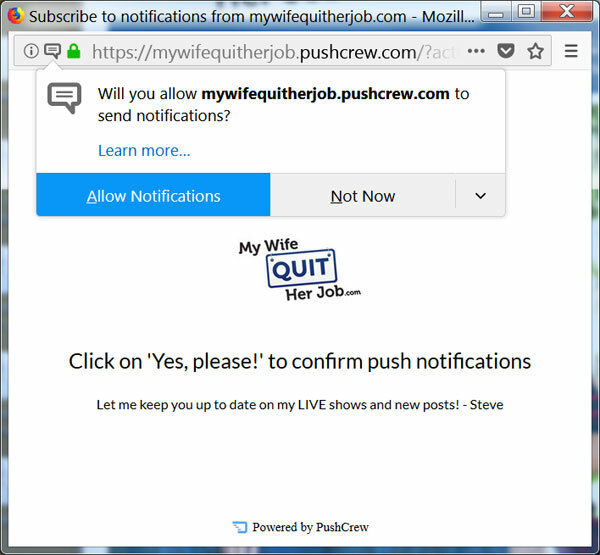 You literally do not need to do a thing and push notifications will be automatically sent out to anyone who has opted in and been on your site. Because Vizury has knowledge of your entire product database, they can dynamically show photos of the exact product a customer was looking at while they were shopping. Overall, push notifications are a great complement to your email marketing, messenger marketing and retargeting efforts. In fact, you should be sending out your promotions to all 3 mediums. Oh wow, that’s a great post. I’ve always thought about using push notifications, but never really got into it. I’ve noticed several big finance bloggers using them. Am I the only one who thinks push notifications are just as annoying as pop-ups? I hate the fact that you can’t browse a website these days without having to remove a bunch of pop-ups, slide-ins, chat-windows and push-notifications. This is one of favourite blog. BTW I want to download your free couse but after endter my email, I did not get any email confirm and download link. Can you please check it ? I always find these push messages annoying and irritating. Most of the time these messages are useless and of no good use. These are annoying like the useless pop-up ads and sites.